At its core, Zoolander is a one-joke skit, stretched out to feature film length. In fact, the Zoolander character did arise from a skit used at the VH1 Fashion Awards. In the hands of most people, Zoolander would turn into any of the many, horrible, Saturday Night Live spin-off skits, but in the capable hands of Ben Stiller, Zoolander has its moments. There are probably hundreds of attempts at jokes, and many of them miss. Some of them hit, and they are actually pretty funny. Derek Zoolander (Stiller, Meet the Parents, Keeping the Faith) is a dimwitted model, one of the best male models in the world. He is nearing the apex of his career. His main competition is Hansel (Owen Wilson, Meet the Parents, Shanghai Noon), an equally dumb and up and coming male model. What neither of them knows is that male models are behind every important political assassination in history. They are so dumb that hypnotizing them to kill is simple. This is what designer Mugatu (Will Ferrell, The Ladies Man, Drowning Mona) is hoping for. He and a cadre of fashion designers want to assassinate the leader of Malaysia for his desire to rid the country of sweatshops. Mugatu hypnotizes Zoolander, and the only person who is smart enough to know something is going on is Time Magazine journalist Matilda Jeffries (Christine Taylor, The Wedding Singer, The Craft). She figures out the entire plan and tries to get Zoolander to realize what is going on. Making fun of the stupidity of models is not new (remember the horrid Head Over Heels). Doing so in such a way that it is funny is. This requires co-writers Stiller (who also directed), John Hamburg (Meet the Parents, Safe Men) and Drake Sather to come up with hundreds of stupid jokes, just so enough will be funny. Stiller also populates the movie with many celebrity cameos. These are more distracting than anything else. The first dozen or so are amusing. People can recognize Fabio, Lenny Kravitz, Cuba Gooding Jr., Natalie Portman, and many, many more. Then, as they keep appearing, they begin to lose their uniqueness. How many people really know who Paris Hilton is? What the heck has Billy Zane been up to these past couple of years? The story quickly runs out of steam, but the jokes keep coming. 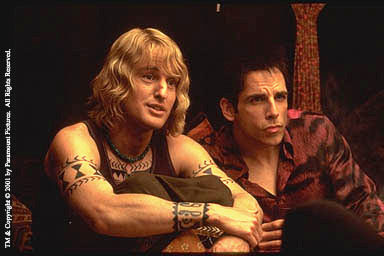 Stiller and Wilson are quite amusing as Zoolander and Hansel. Apparently, in this make-believe world, models all have 'looks.' Stiller purses his lips and squints his eyes. He delivers his lines with a vapid tone meant to relay his mental ineptness. Taylor (Stiller's wife) plays the straight 'man' to Hansel and Zoolander. She does not have much to do except roll her eyes when they make a dumb comment (which is often). It is nice to see Stiller veer away from his typical frustrated man role, and Wilson is amusing as always in his typical supporting role. They live in bliss because of their gross ignorance, but something is happening to Zoolander. At the beginning of the movie, he loses the Male Model of the Year Award to Hansel, and this causes him to begin to question his real purpose in life. Which brings to mind the purpose of the movie. It may not really have one, but the non-stop barrage of jokes is nearly enough to forget this. 1 hour, 45 minutes, Rated PG-13 for sexual content and drug references.